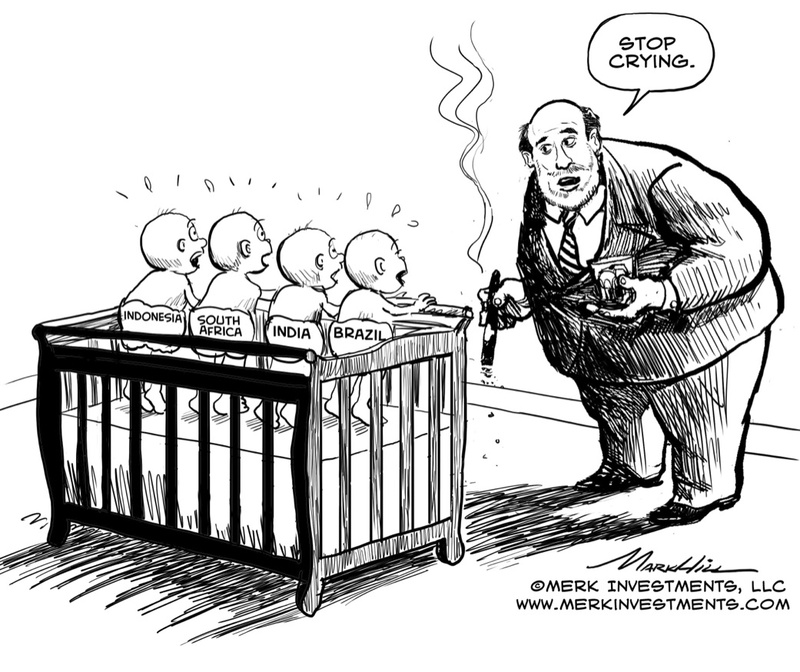 Merk Insights - Fed Responsible for EM Crisis? Fed Responsible for EM Crisis? Talking to politicians around the world, they have a few things in common. One of them is that it’s always somebody else’s fault. However, few tears should be shed for countries that have missed the opportunity to take advantage of the good years to engage in structural reforms to make their economies (and, as a result, their markets) more resilient against the whims of the Federal Reserve. While some EM countries made great strides in developing a more mature regulatory environment, in encouraging competition in the banking sector, of developing domestic and offshore fixed income markets, others limited their efforts to imposing taxes on hot money flooding their markets. That money wouldn’t have needed to be so hot, if there had been a cool place to invest in. But if sovereign debt markets are the only game in town, don’t be surprised if that’s where the money flows. Last August we explained in more depth why the weaker emerging markets are rather vulnerable. Today, we’ll stay at a higher level, focusing on how we think these dynamics may play out. First of all, we have no sympathy for investors being caught in the turmoil. Before the flight out of emerging markets, we saw yield chasing investors embrace what appeared to be a free lunch, notably buying local debt in these markets. It was great: the yields were relatively high, while tightly managed currencies provided the illusion of low risk plus upside potential. When “risk was on,” floods of money poured into these markets. A beauty about exchange-traded funds is that they can provide access to otherwise illiquid markets. Except that these products can then trade at a premium, as more money flows into these markets than the local fixed income markets could readily absorb. It didn’t take a rocket scientist to suggest that if a bunch of investors headed for the exit at the same time, it might get rough. Our suggestion to consider reducing hidden interest rate risk by focusing on more established EM and cash instruments rather than chasing yield in longer-term bonds fell on deaf ears. One very large investment shop we talked to put it succinctly: “we have a strategic allocation to EM local debt” – I guess their “strategy” was to run for the hills at the first sign of trouble. And no, these investors are not learning their lessons. They are wired to live on the edge, in the erroneous belief they can jump ship before a bubble bursts. Of course, that rarely works. This time around, these yield-chasing investors didn’t take a break. Rather than hiding in the perceived safe haven called the US dollar, they went straight into the peripheral Eurozone. There’s relative calm there; after all, European Central Bank (ECB) President Draghi has promised to do “whatever it takes.” As those that follow us know, we are far more positive on the euro than many others are. However, that doesn’t mean we think investors get rewarded for the risks they are taking on buying debt in some of the weaker European countries. Not satisfied with fixed income returns, another round of investors then came to push up the equity markets. There’s some good news in this: it’s far healthier for risk-friendly capital to chase yields than it is for tier 1 capital of banks to be exposed to such securities. As a result, when the next crisis flares up in the Eurozone, odds are much better that “contagion” is limited. Differently said, a crisis in the Eurozone may no longer be a crisis for the euro. But I digress. Is the EM crisis a buying opportunity? Because liquidity in EM markets is lower, they tend to be most vulnerable when volatility spikes. A key source of the volatility is, in our assessment, the Federal Reserve. We believe Fed policy may be volatile for the following reasons: our highly levered economy might over-react to any real tightening should we get it; the Fed doesn’t really know how to get the economy back to normal (incoming Fed Chair Janet Yellen suggested monetary policy will revert back to normal once the economy is back to normal; that’s an oxymoron because we can’t have a normal economy in a monetary environment that prevents risk from being priced properly); and because we don’t think we can afford positive real interest rates (good luck financing government debt at rates that historically would have been perceived as normal). In our assessment, there are plenty of opportunities for more violent reactions in EM as a result of what the Fed might be up to. As indicated, this doesn’t equate to us blaming the Fed for the woes of EM, because policy makers in EM need to embrace reality and get their economies ready for what may be turbulent times ahead. That’s another spoiler alert: this global financial crisis may be far from over, as we still have too much debt in the world. And if there’s one thing we are reasonably sure of, it is that we don’t think policy makers will give up trying to kick the can down the road. We see Brazil and South Africa among the most vulnerable. Turkey is subject to self-inflicted dynamics and proof that the markets are ultimately stronger than politicians. To get on a steady course and regain market confidence, structural reform, not kneejerk reactions by central bankers or politicians is needed. Investors looking for buying opportunities may want to look at the more advanced Asian economies or India. Although India is one of the weaker EM countries, the new leadership at the Reserve Bank of India has started to introduce some real reforms; additionally, a new government in the springtime might follow-through with important reforms. Having said that, India does not have a good track record in actually implementing reform. And it’s still a weak country, so India may well be drawn downward in any EM turmoil. But India might bounce back more and, over time, become more resilient. Still, investors must be aware that this is not for the faint of heart. We prefer taking the currency risk over embracing interest rate, credit or equity risk. Similarly, when we talk about opportunities in established EM, we are thinking China. China certainly has its share of challenges, but many of their reforms are in the right direction. We don’t think a bursting housing bubble in China is as detrimental as many predict because only a small portion of buyers take out loans to buy an apartment. We also think that a transition to a more domestically driven economy may happen much faster than many anticipate, if only for the push of the government to encourage competition in the banking system; that’s because small and medium size enterprises (SMEs) have had to go to loan sharks as they have historically had a difficult time qualifying for the government set cost of credit that state owned enterprises (SOEs) have access to. With more competition, credit might actually get priced according to the risk profile of borrowers, which could lead to a major entrepreneurial boost. However, it may be a rocky road, as the bailout of some investment schemes suggests: fostering a too big to fail attitude is poisonous for sound capital allocation. But even the naysayers for China should be aware that, a bit like the U.S., China is a big fish in a small pond and may be perceived as a regional safe haven.